The island of Santorini has been named one of the most romantic places in the world—and Mystique enhances that image beautifully. Did we mention that weddings are a specialty here? On the northernmost tip of the Greek isle of Santorini, the village of Oia is famed for some of the most staggering views in the world. And with its luxury suites and freestanding villas carved into the island's volcanic cliffs—each with a private sea-facing balcony—the quintessential Greek resort of Mystique offers an exquisite vantage point from which to experience them. This stunning whitewashed retreat has barely a hidden corner that doesn't offer panoramic views of the Aegean caldera, the spot where the lost city of Altantis is believed to rest. Here, among its rambling walls and cliff-side terraces, is where ancient myth and modern-day luxury collide. Floors are crafted from locally quarried limestone, furniture is fashioned from whimsical pieces of driftwood, and beds are dressed in pure, unbleached cottons and linens. 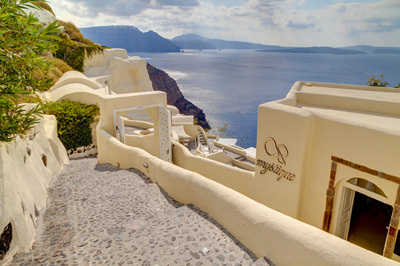 Should the beauty of Santorini lure you from your room, why not take in the island's startlingly white amphitheater architecture, blue-domed churches, and black sand beaches from a private tour organized by the hotel's concierge? Return to a private massage in your suite or on your terrace, and a refreshing dip in the infinity-edge pool. After a swim, pamper your taste buds with a drink and delicious meal at the barefoot-casual Aura pool bar, or indulge in freshly caught lobster and regional cuisine at Charisma restaurant. Whatever your day brings, be sure to return to the resort for the most luxurious vantage point from which to view Santorini's magnificence. And let Mystique's sommelier choose for you from among the resort's rare and indigenous wine selection, stored in a 150-year-old secret wine cave; it's the perfect accompaniment to toast an end-of-day show of mystical illumination.